BBC Radio 5 live - 5 live Boxing with Costello & Bunce, Mayweather v McGregor: A puncher’s chance? Mayweather v McGregor: A puncher’s chance? It’s the fight everyone’s talking about, but can Conor McGregor get near Floyd Mayweather? Mike visits McGregor’s first boxing club to find out what he was like back then. The fight everyone’s talking about is on the agenda, as Mike and Steve break down why the fight is happening and debate whether there’s any way Conor McGregor could shock the world against Floyd Mayweather. Unified middleweight world champion Gennady ‘GGG’ Golovkin and six weight world champion and former Mayweather opponent Oscar de la Hoya have their say. 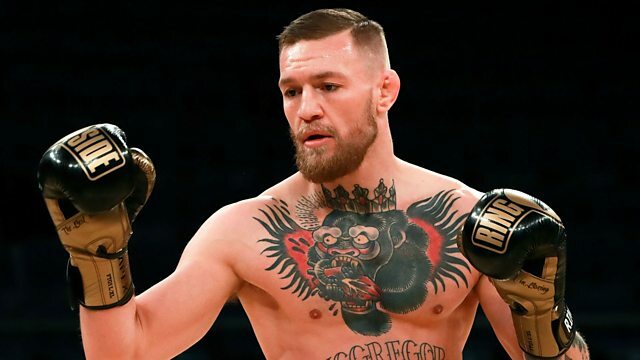 Mike visits Crumlin Boxing Club in Dublin to speak to Phil Sutcliffe, the man who trained McGregor growing up, to find out more about his grounding in the sport of boxing. Also, Mike and Steve discuss whether the stoppage in last weekend’s Andre Ward v Sergey Kovalev fight in Las Vegas came too early. How can McGregor beat Mayweather?